The merino co/pivot button up shirt is a listed on outlier’s site as “[a shirt] to travel the world in” and that’s near exactly what I did. 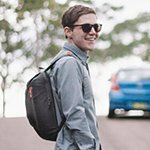 I travelled throughout most of Asia with this and a few other merino t-shirts. Because the shirt is 59% merino wool it wicks water and prevents smells from absorbing into the fabric. The material itself is made of a blend of extra fine merino wool and cotton. It’s 59% merino and 41% cotton, this gives the shirt all the excellent qualities of merino wool and the cotton adds more breathability and rigidity to the cloth. The shirt is well designed, it features a “storm welt pocket” which is great for concealing a credit card while travelling. It also has Outlier’s patent pending ‘pivot sleeve’ for freedom of movement and it also features hidden collar buttons. In terms of how the fabric performs on the road, I would say that it definitely breathes very well and I have noticed that after being in a place with a lot of second hand smoke, and even in hot pot restaurants that I’ve come out without any lingering odors. The merino keeps you warm when its cold and cool when its hot, certainly worked well in this regard when I was travelling. When it comes to washing and drying the shirt it again stands out as something special. It dries exceptionally fast and no only that but you need only shake the shirt a few times after pulling it out of the washing machine to get the wrinkles out, no need to iron in my experience.